Little one has been discovering India through the exhibits that we’ve seen at the International Festival where he was able to see how a woman was getting a henna tattoo done on both her hands by an Indian woman dressed in traditional attire, and he also had the opportunity to see a small exhibit of Indian dolls, and clay pots. He’s learned about India through his subscription to Little Passports, about the music, instruments, and culture in the children’s book Dances of India; and through hands-on activities such as making a colorful peacock craft the national bird of India. 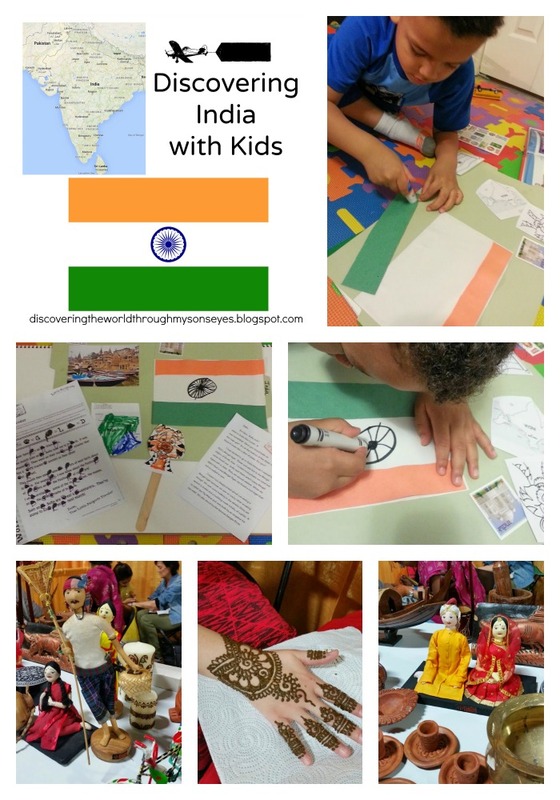 He has also been very fortunate that his 1st grade teacher, and three classmates are from New Delhi, India.It’s so important for our children to be exposed to other cultures and to learn about them. Today we’re making a simple flag from India using construction paper. We’ve been learning about the flag, and reading Sam and Sofia’s letter about their adventure in India, and he even made a Bengal Tiger puppet! Society throughout India is divided into social ranks, called castes. Caste is determined by birth and there is almost no way to change it. High castes include priests, landowners, and soldiers. So-called Untouchables have no caste and do the most menial jobs.